These energy centres are associated with health and organ functions, spiritual and philosophical awareness, a veritable energy filtration system which also corresponds with psychological development, life cycles, seasons, foods, and colours spanning the complete spectrum. With much of this in mind, I recently built a model for a public art commission proposal at a hospital, requiring an approach sensitive to health, mental well-being and balance. 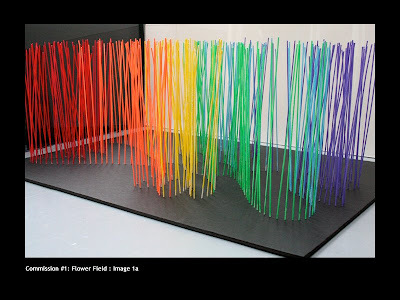 The clear cast acrylic coloured rods of this sculpture will glow in daylight, reflecting onto the surrounding 4 walls of glass, moving across a spectrum of colour, revealing at its base, a flower. 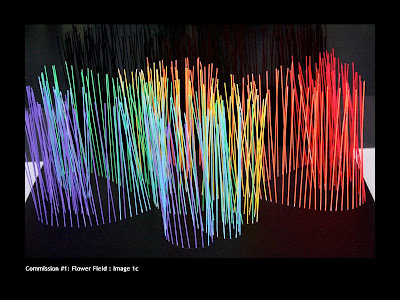 At night from an underground brilliant white LED array, each rod will light individually, forming a gently shifting and swaying field of vibrantly coloured, glowing rods. 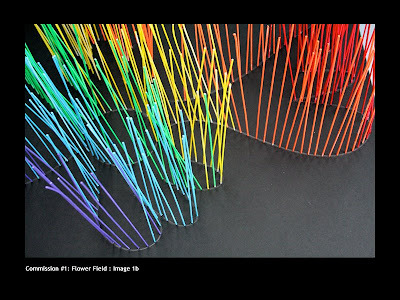 The model above represents a work which would stand about 1 meter high and 8 meters long, and reside in a sealed glass enclosed courtyard. If Paradise is defined as an enclosed space looking to heaven, I am praying for this bit of it. This entry was posted on Wednesday, January 30th, 2019 at 19:08	and is filed under For Peace. You can follow any responses to this entry through the RSS 2.0 feed.